Scientists have carefully studied and tracked the history of water on the Red Planet. 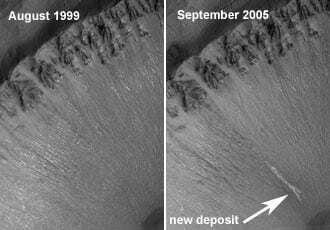 It is now widely accepted due to the geomorphological evidence that Mars had an ocean of liquid water billions of years ago. This ocean covered the northern hemisphere. This is indicated by the lower altitude of the surface, smoother and geologically newer surface of the northern hemisphere, as opposed to the higher altitude and the more jagged appearance of the highlands of the southern hemisphere. An ocean covering most of the northern hemisphere has consequences such as a thicker atmosphere and warmer temperatures.